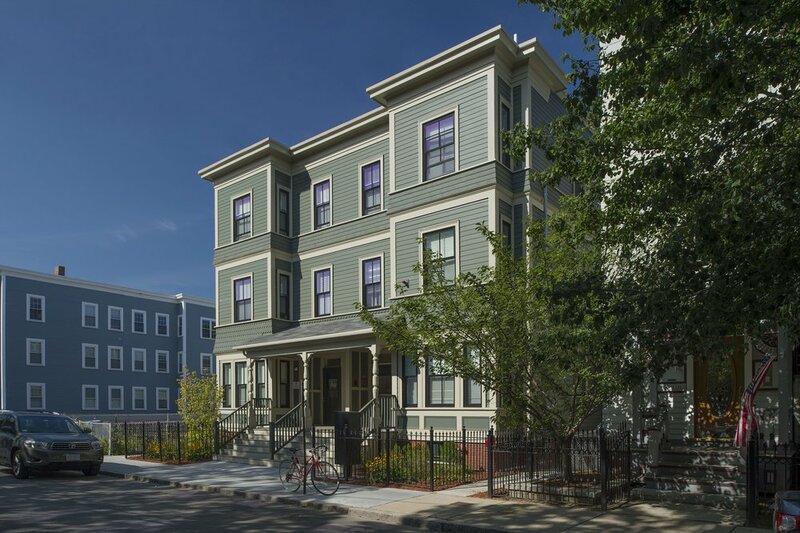 Allston Street in Cambridge, MA is home to a multi-family affordable housing development owned by Homeowners Rehab Inc (HRI). The Narrow Gate completed a gut renovation of the six-family house after a 2014 fire destroyed the entirety of the building’s third floor, and damaged the rest. After temporary relocation, four of the six original families have returned to their home, with two new families joining the new and improved building. While the exterior renovation primarily restored the original design, there were a number of improvements, inside and out. HRI’s mission as an organization includes a component of sustainable building, which The Narrow Gate was able to pursue to great success. The project achieved LEED Platinum status, as well as a Home Energy Rating System (HERS) index of 29 - meaning that the building is 71% of the way to net-zero energy use. Sustainability improvements include a number of improvements to the building envelope (such as improved insulation, air barriers, and windows) resulting in substantially reduced heating and cooling costs, low-energy high-efficiency appliances, and a solar hot water heat collection system. The design also involved the interior renovation of each unit with kitchen and bathroom improvements, and a newly landscaped shared back yard.